“Yikes!” say the Jitters, and then even more Jitters arrive. When Jacob woke up, everything was great. But when Jacob goes to bed, everything gets JITTERY! That’s when the Jitters appear and the troubles begin! You try getting ready for bed with six Jitters in your way and they keep multiplying! 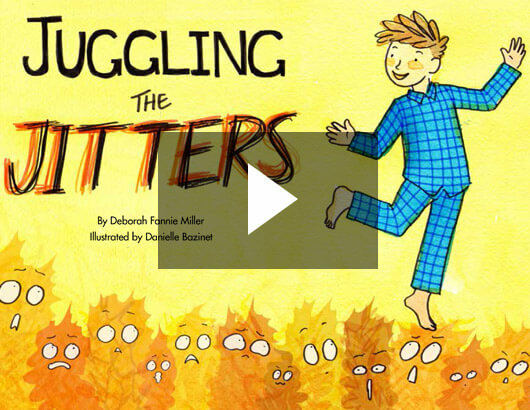 This is Jacob’s funny and frustrating problem in Juggling the Jitters. With every “what-if-iffer” and “maybe mumblie,” the Jitters fill up Jacob’s room until there is no room left for Jacob. Finally, with Dad’s help, Jacob silly dances and sings those Jitters into Glitters that burst into stars. — Lawrence Cohen, Ph.D., psychologist and bestselling author of The Opposite of Worry: The Playful Parenting Approach to Childhood Anxieties and Fears. This book is timeless both in artwork and in content. Juggling the Jitters was illustrated by Alberta born and raised Danielle Bazinet, a recent graduate of the prestigious Alberta College of Art + Design illustration program.